Although Christmas and Blogmas are over, I thought today would be the perfect opportunity to share the Little Known Box with you guys, especially if you're thinking about looking into beauty box subscriptions for the New Year! I absolutely love the idea of the Little Known Box and how it finds the small independent brands out there to all work together to create this beautiful black box. It's such an attractive box, I didn't want to open it when I received it as it was just too pretty! "Little-Known Box is the UK’s newest luxurious beauty subscription box, we ship 5-6 products to you per month, to discover, try and enjoy at home. In addition to monthly subscriptions we offer gift subscriptions and one-off boxes, providing a truly flexible beauty subscription experience! 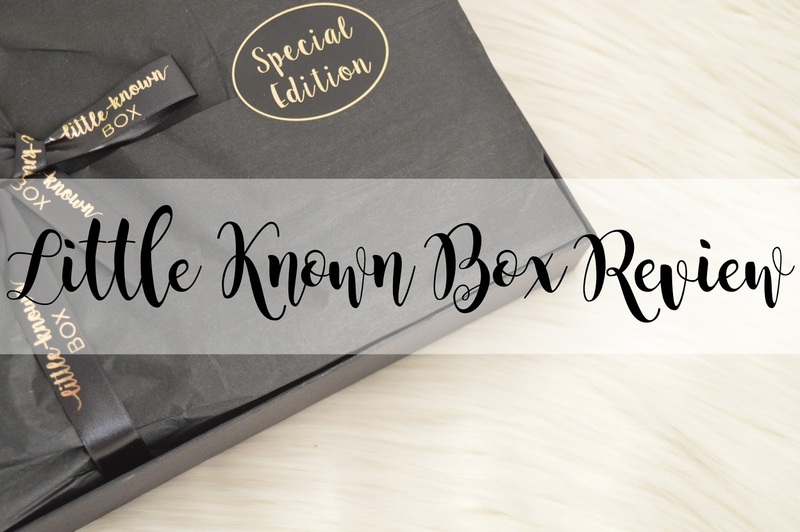 The people over at Little Known Box are passionate about featuring and introducing you to breakthrough products from upcoming, niche and independent brands we know you will love." I had never heard of Lin & Lo before I opened up the Little Known Box and how beautiful is this lipstick? I absolutely love it! It's a beautiful shade and the packaging is gorgeous. The packaging of this lipstick is magnetic which I was completely amazed with. I have never seen a magnetic lipstick in my life until now; wow! I highly recommend trying out Lin & Lo lipsticks! Merumaya is another brand which I've never heard of before but that's the whole point of these subscription boxes; finding brands which are so small and getting them out there! This is their Melting Cleansing Balm. A gorgeous smelling product which makes your skin feel absolutely incredible! "A cleansing balm from MERUMAYA that spreads effortlessly over your skin, melting on contact so that your fingers glide easily, picking up make up and the day's grime. When you add water to the massage, it turns to a light milk, making it easy to remove". I've noticed this is a product which features in many different beauty boxes and it's the Herb Garden Relaxing Massage Bar which you can buy for only £5. I really love the idea of Massage Bars' and how they're created to not only pamper you but to relax you at the same time due to the ingredients which are used. This smells and feels incredible, I highly recommend trying these out. "With soothing chamomile and lavender, this is a perfect classic mix. Our blends use high quality organic essential oils and in this case we use German Chamomile which is a fantastic oil and rarely used in combination blends". Samaya Skincare is a brand which provides top quality anti-ageing creams. All three creams include different anti-ageing ingredients which contain an intensive blend of active compounds that visibly reduce the appearance of wrinkles. The result is skin that feels supple and firm, with a youthful and revitalised appearance. What I love about these are how they're scent free! The Little Known Box also included their very own product; a beautiful gold mirror with the quote "Today is going to be amazing". I absolutely love pocket mirrors and I tend to break them quite easily but this one is gorgeous and easy to slip into your hand bag or even your pocket so you always have a mirror on you! I love it! The one item I loved most within this subscription box is the Fab Little Bag; the bags which are perfect for confident tampon disposal! They're so pretty and such a great purchase to keep in your bag for the "just in case" moment! "This is a discreet little bag that you can drop your used tampon into and then seal securely with one hand using the patented clever finger loops, this is really useful if you are holding a used tampon in the other hand! No need to worry about if there is a bin, or if you have a nappy sack on you or if there is enough toilet paper to wrap it in. FabLittleBagTM puts you back in control of disposal, every time, anywhere…" However, you do have to remember to take these with you otherwise you'll be left with nothing! Have you tried out the Little Known Box? What neat little items! Love the tampon pouch and the color of that lipstick in particular. Thanks for sharing these with us! I love this box! It's really adorable, offers a good range of items. Nail wraps are my favourite, I love doing creative stuff with my nails. I absolutely love beauty box subscriptions but never seem to be able to justify them, I'm going to have a further look into this one though!